Even the happiest person ever, have at least ten black things in his wardrobe, but you can’t disagree that it doesn’t immediately makes you a pessimist. But finally not everyone is brave enough to make the interior in the dark and especially the black color. And that a pity because black is such an elegant color if you know how to use and combine it well. That’s true – it’s not that easy to decide to use the black in the interior. In our culture most of the times its associated with mourning and the child’s horrors about the “black – black room”. But on the West it’s conversely the sign of kindness, perfection and purity and in Japan it means the rising of nobility and experience. Not to shock the society the designers put the black color piece by piece almost with the measured doses. It all started from accessories when few years ago it’s been showed up on the Paris exhibition the line of vases made from the black crystals. Then the relay race has been caught up by Italians that started to use the black color in producing the lighting fixture made from Murano glass. 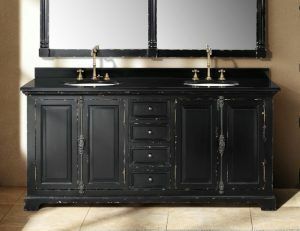 And finally the designers got brave enough to use it everywhere: in sanitary engendering, floor, dishes and everything started to become more and more black. The unique possibility of black color furniture is that it perfectly contrasting on every background. So it’s not necessary to buy the full sanitary engendering set made in black you just need one thing and it can be the bathroom vanity, that is gonna attract all the eyes to it. 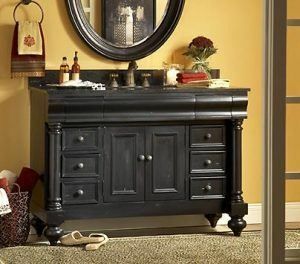 So you can establish the black bathroom vanity and to make it diluted with the colorful elements such as toothbrush holder is something else. Sometimes it feels like black is going out of fashion but then another company makes it the color of the season such as Kartell. As on the Milan exhibition Salone de Mobile 2010 Kartell presented the installation where painted all the furniture in black. 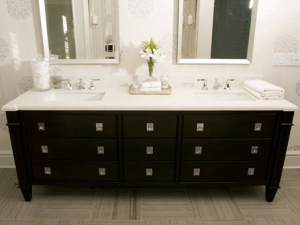 The types of materials the bathroom vanities can be made of. 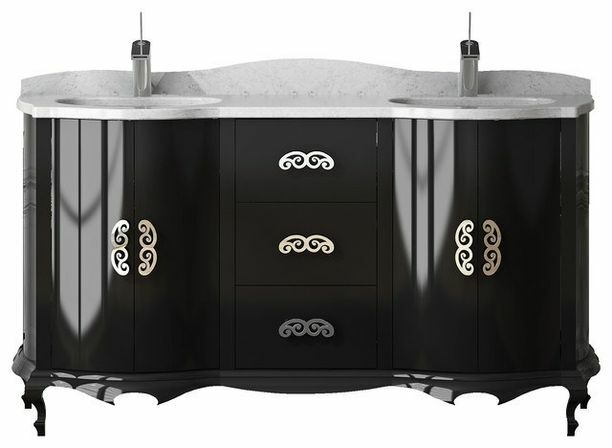 The sinks for the bathroom vanities are usually made from the glass, ceramic, natural or fake stone, faience, treated wood or concrete block. 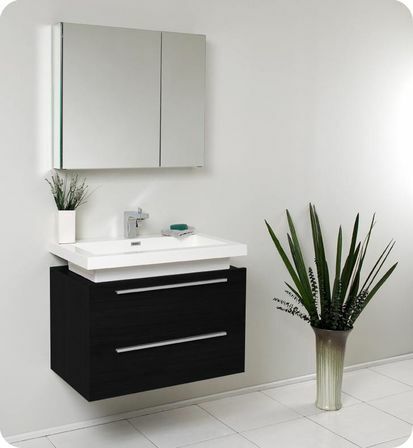 The bathroom vanities itself can be made from wood, compressed sawdust, glass or polymeric materials. 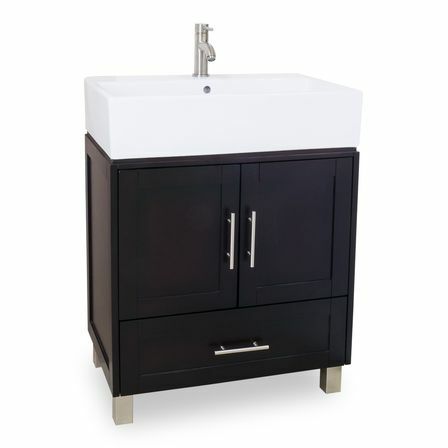 If you want to buy a not expensive sanitary engendering than the faience bathroom vanity won’t be a bad solution, but it also has it’s limitings such as high level of porosity that will need a super special caring because the dust is gonna get stocked in it’s pores. From this point the sinks made from porcelain are way more optimal as it’s surface doesn’t get dirty so quick and it’s getting clean easily. The sinks made from marble looks really gorgeous, but costs way more expensive then the one made from faience and porcelain. 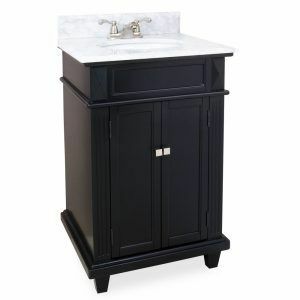 Moreover the natural stone weights pretty much that’s why the bathroom vanity should be really lasting to handle it. 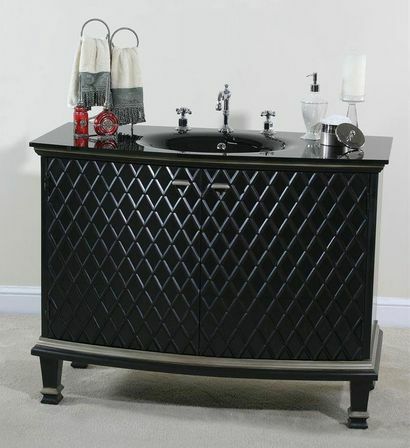 The sink made from glass will look really stylish placed on the bathroom vanity, but this material is really fragile that why you should be careful while using it. In the last model’s production the specialists started to make the material which makes the sanitary engendering way less sensitive to mechanical damaging. Most of the times the glass sinks go in the combination with the bathroom vanities made from the wood or metal. This construction isn’t just stylish, but also reliable. Italy (Antonio Lupi and Labor Legno). Of cause we used to think that the foreign countries can provide us with the better quality as all the modern innovations comes from there. But it’s not true from the point that even the domestic factories are not that well-known as the foreign ones the main thing is that they still use the pieces produced by the foreign companies and use only the modern technologies to provide us with the best quality. But the main advantage here is that because of the small distance transportation and no tax paying it’s gonna cost much more less which is really good to know. 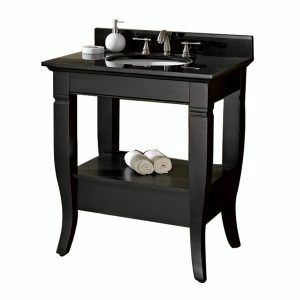 The main advices how to choose the perfect black bathroom vanity. The perfect way of looking is the main guarantee of no inside cracks, dents and stains which is the main way of providing yourself with it’s good level of lasting. 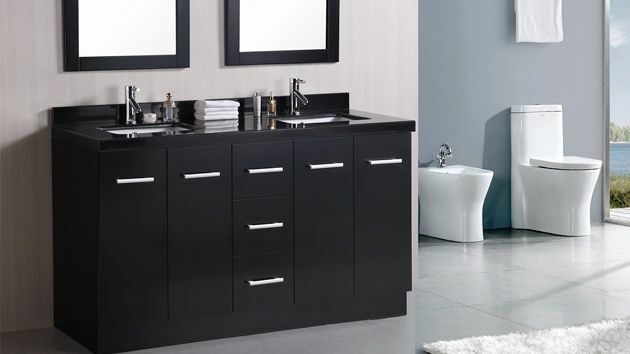 Choose the accessories and the main furniture elements me from metal which is even better if it’s gonna be chromed, because of you will choose the plastic ones, you won’t get anything, but disappointment which is gonna come already after the first year of bathroom vanity using. 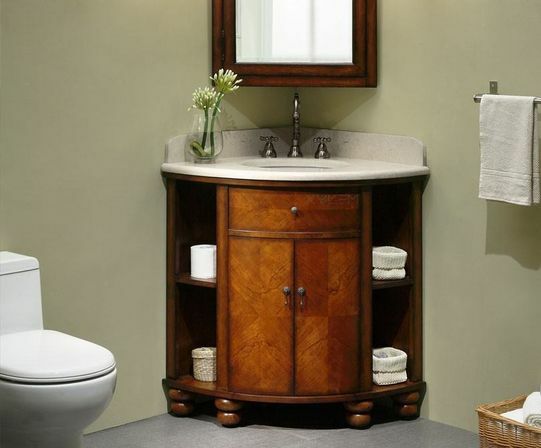 The bathroom vanity should be really convenient and have as much shelfs and other functional elements as its possible. 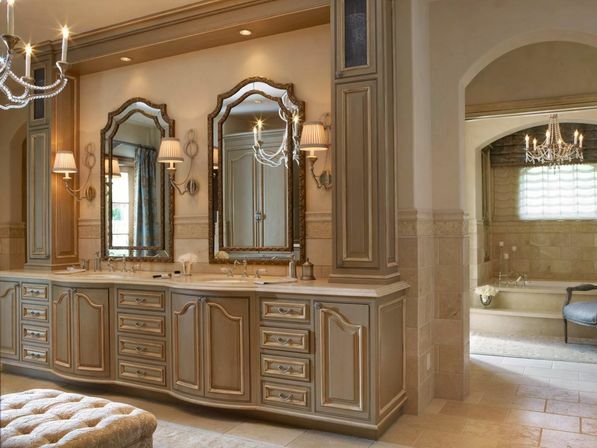 And surely don’t forget that the bathroom vanity decoration should fit the rest of the interior. 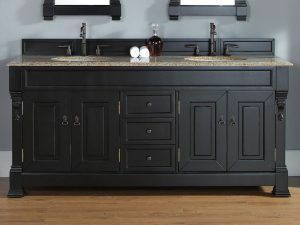 It’s not much to tell about the materials you can use and especially the colors as we are talking about the black bathroom vanities. But whatever color you buy you will still need to establish it and it’s exactly what we are going to talk about now. 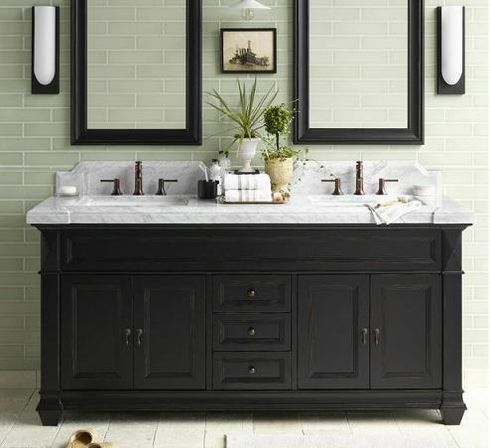 The first thing you should do even before buying I’d to think about and find the place you want your bathroom vanity to be because you will need to withdraw the pipes for the water and sanitation so later you don’t have the problems with it. Making the areas measuring and making the marks make sure that nothing will prevent the doors opening and the whole space is gonna be generally used good so you can free move around and have enough space at all. If you bought the bathroom vanity pieces that you will need to gather all together than you should make sure that you have all the tools you will need. Most of the times it’s such standard tools as a screwdriver and an adjustable wrench, but if you decided to buy the mixer separately that you should make sure you also bought a siphon and the wiring for the hot and cold water. 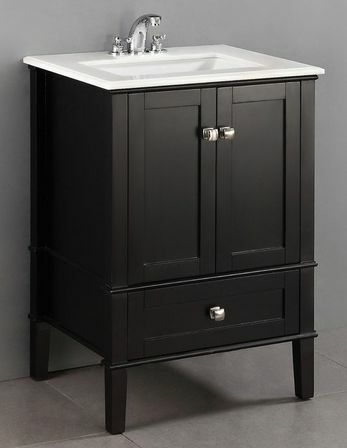 You don’t really need to worry a lot about all this process because most of the bathroom vanities are equipped with the detailed instruction that you will get while buying it and all you need is just to make sure that you screw all the screws in the right way and strong enough so you don’t need to redo the whole work. It’s better to establish the mixer the wires before the bathroom vanity establishing to the place it’s really gonna stay. The same thing can be done with the siphon. 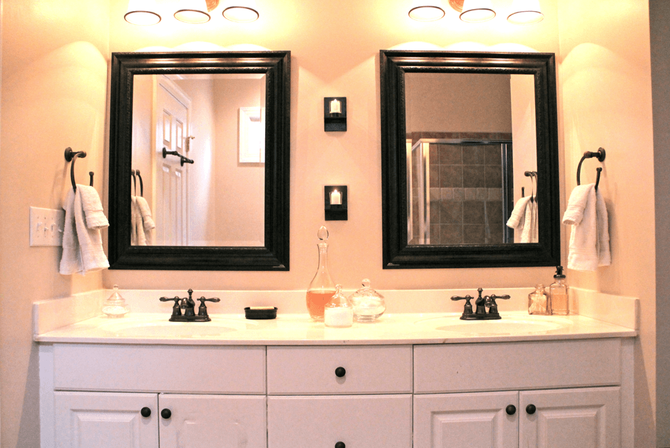 Switch off the water before the exact moment of bathroom vanity establishing. 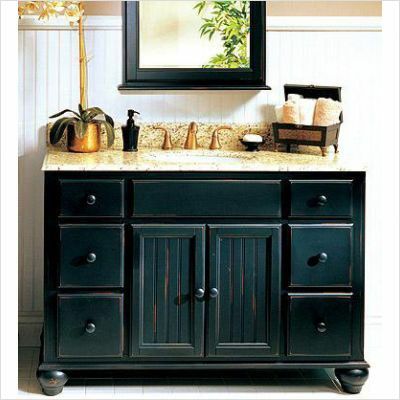 If the bathroom vanity should be fixed straight to wall then you should take care about all the holes you gonna use. After you establish everything all that is gonna stay left is just to make sure it’s working! We are done! Enjoy your hot and cold water and the black bathroom vanity!